By Peter Anderson 12 Comments - The content of this website often contains affiliate links and I may be compensated if you buy through those links (at no cost to you!). Learn more about how we make money. Last edited March 8, 2019 . Since I recently became more deeply involved in keeping track of my family's finances (because of starting this blog), I decided that it would be nice to find a way to keep track of our finances online. Ideally we should be able to monitor all of our online accounts, regardless of what institution they're held at. We should be able to track balances, monitor big transactions, and be able check it from anywhere. In brushing up on what was out there I found a bunch of reviews of a relatively new online software for monitoring your personal finances from mint.com. It is billed as being the, “freshest, most intelligent way for you to manage your money online”. It is a free product (I like free), and from their own descriptions of the software, it should be “virtually effortless” to use their software. After viewing a few of the alternatives, I decided to give Mint.com a chance. The first thing you notice when you come to Mint.com is their beautiful, refreshing design. It has a very Web 2.0 feel to it, and the color scheme in various hues of green makes you feel like you'll be rolling in it (green) very soon! It is very pleasing to the eye, and while that may seem to be a small thing to some, in my opinion its something that can keep people coming back, or keep them from coming back. In this case their design is a definite plus. In setting up my account for the first time, the first thing I did was bring together all of my account numbers, online account usernames and passwords, and anything else I thought I might need to set up my accounts with Mint. I honestly didn't know how much information they were going to need, so I got it all. They brag on their website, “With Mint, you can be fully up and running in less than five minutes”. I didn't find that to be fully the case in my instance, but I don't think my difficulties setting up the software were in any way representative. Most of our accounts (the ones with major national banks) were very easy to set up. We just inputted our usernames and passwords for those accounts, and within a minute or two Mint.com had logged in, downloaded account and transaction information, and set us up ready to go. Two of my accounts with our local bank had some difficulties in setting up the usernames and passwords of our online accounts, but those were more problems with out local bank, and not mint.com. So if all of our accounts had been with large national banks I think we honestly could have been ready to go in LESS than 5 minutes. It was a very smooth and pain free setup process. Once you enter all of your information and your transactions are downloaded, you can begin using the software. The website has 5 main tabs that you can use to track your finances. First, the “overview” tab allows you to get a broad overview of your finances, what your balances are, a brief look at your budget (that you setup elsewhere), alerts for large deposits, withdrawals or account balances, as well as ways that you can save money. There is quite a bit of information on that main page, but a lot of it is stuff you'll need to setup elsewhere in the software. I found the alerts section on the homepage especially helpful because it allowed me to see when my balances were getting low, when we spent large amounts of money on something, or if certain deposits had gone through. It even allows you to set up an alert to notify you if there are any “unusual spending” in your accounts, which means that you've spent more in a certain category than usual. The second tab is the “transactions” tab. This tab allows you to view all of your downloaded transaction information for all of your accounts. You can view the items either by individual account, or with all of the accounts together. The register on the page will show the merchant name, the category of the expense, the amount and the date of the transaction. I did find that a lot of the transactions that I downloaded were either not categorized by the correct merchant name, or the correct category. This is somewhat understandable as not all of the merchant names were very recognizable, but at times the software would take a merchant name, and transpose it to mean something else. Then, it would assign an incorrect category based on the incorrect name. This is a minor quibble with the software as this problem was easily fixed when found just by clicking on the category or merchant name, and making the necessary changes. It was a pretty prevalent problem, however, and hopefully one they'll be able to improve in the future. You are also able to add notes to each transaction in case the item needs further attention. The third tab is the “spending trends” tab. When you click on this tab the page fills up with charts and graphs. One is called “Where you spend” and it details all of the categories your expenses are going to. For me this was a very useful tab because it allowed us to figure out just how much money we were spending on eating out. We knew we were spending a lot, but we had just never figured out exactly how much. When we saw on the spending trends page just how much that figure was, we were horrified to say the least. 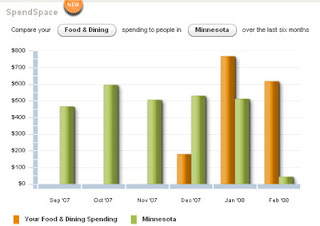 The second part of the page is called “spend space” and it allows you to compare your expenses against those of other people in your area, or across the country. Once again we found this very useful because sometimes you may find out how much you're spending in a certain area, but you think that it is within the bounds of a reasonable expenditure. By viewing this section we found that our expenses for dining out where well above the average for our location, as well as nationally. Very eye-opening. The fourth tab is called “ways to save”. This page will look at your accounts, and figure out ways that you can save money. For us it found that we had a large amount of money stashed in a low interest bearing money market account. It suggested that we move that money to a high yield online savings account, and as a result we would gain about $800 in interest for the year. Not a bad idea. It also suggested credit cards with lower interest rates, and checking accounts with higher interest. In all it gave us ways to save about $930 for the year. We were already planning on moving our money to the high-yield savings account, so that savings of $800 in additional interest is one that we will be enjoying. The final tab is the “accounts” tab. This is the tab where you can add or remove accounts and keep track of all your logins and account numbers. Also, when you login to your account you can come to this page and ask the software to “update” all of your accounts by downloading new transaction information. It does this already automatically, but it may be a day or so behind sometimes so it doesn't hurt to do a forced refresh. Balance and spending alerts: keeps you up to date on what money is coming in, or out. Ways to save alerts: Make sure you're getting the most out of your accounts that you have. So far in the three weeks I've been using Mint.com I have been reasonably impressed. The software has brought to light some things that we need to change, as well as being a simple and straight forward way to keep tabs on our main spending accounts. Granted, the software didn't allow us to enter our 401k accounts, and we did have a few login issues with one of our bank accounts, but the software is also free, and is still in beta. They are making updates all the time and I expect a lot of these issues will be ironed out in the near future. I will happily recommend Mint.com as a nice basic personal finance manager. It is simple to setup, easy to use, and is a great way to keep track of your accounts while you're out of town. The small issues we had with the software were easily overcome by all the useful things it can do. While we won't stop using our Microsoft Money account on our home desktop, we'll be using this as a nice additional tool that we can use when we're on the go. So go out and sign up for a free account today! Mint.com is a personal finance management software that allows easy anywhere access to your family's financial accounts, budgets and spending trends. Here's a review. I just close my mint account. I prefer using Excel it’s really simplest than Mint. What Excel program did you go with? top 3? I like Tiller Money. It can be used in Excel, or on Google Docs via the spreadsheet software.. Tiller Money Review. Webware cnet review just did an article on Quicken Beam for those interested in trying another online finance solution. I’m using Mint now but I’m not that impressed with compared to my personal Excel option either. On the other hand, it is nice to be able to view all my up-to-date balances in one place. @Johnk – I just use mint.com as a quickie “what do i have in my account” type option – not as an actual budget tool, or something to keep close track of income/expenses. Thanks for the link – i’ll check out the quicken beam software. You can enter your 401k accounts and IRAs now. I have used Mint for about 2 months. However, it has not been able to update my accounts for well over a week and help request were answered vaguely and in broken English. Makes you wonder about this outfit. So, in your review please look not only at the product but also at the organization so folks know whether this is a storefront. My biggest gripe was the speed. I have basic DSL, 1MBPS download speed max…. took mint some time to update my accounts info. Mint is just like Bank of America online or any other personal management software. The key difference is ease of use, flexibility, and of course the wide banking selection. You can join Mint.com regardless of where you bank. Plus, you can customize it to suit your needs whether business or personal. The categorization problem is common among all personal finance software, especially if you buy some weird stuff. My biggest problem is the logging in issues, which do get pretty annoying. I talk more about these issues in my mint.com review so please feel free to read for more in-depth content. I closed my mint.com account and would recommend others to do the same. Think about it… how do they make money if the site is free? they sell advertising space based on your personal information. If you have large bank balances, you see ads for income annuities and high yield savings accounts, If you have money in high yields accounts, they push online brokerage ads your way. If you have an advisory account, you see ads from low cost, low service firms. They have no interest on you taking control of your finances, they just want you to click on their ads or get frustrated with their site, so you buy one of their premium products.